Published on April 22, 2010 in COP, Elections, General T&T, NJAC, People's Partnership, PNM, Politics, UDeCOTT and UNC. 9 Comments Tags: Ashworth Jack, Errol McLeod, Fyzabad, Jack Warner, Kamla Persad-Bissessar, Makandal Daaga, Movement for Social Justice, NJAC, Patrick Manning, Politics, Property Tax, T&T Govt, TOP, Winston Dookeran. LEFT: David Abdullah of the Movement for Social Justice, Congress of the People (COP) political leader Winston Dookeran, Tobago Organisation of the People (TOP) leader Ashworth Jack, United National Congress (UNC) leader Kamla Persad-Bissessar, National Joint Action Committee (NJAC) leader Makandal Daaga, and chairman of the Movement for Social Justice Errol McLeod. 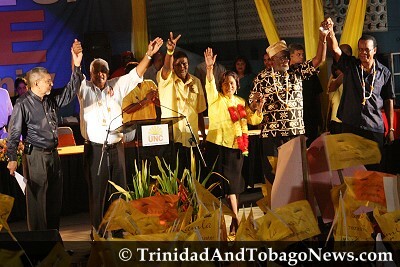 HISTORY was created at Charlie King Junction in Fyzabad when before a mammoth cheering crowd, the nation’s Opposition parties signed a historic ‘Declaration of Political Unity’, last night.